Manufacturing & technology development | NAGAE Ltd.
Diecasting Specialist – NAGAE Ltd.
As your one-stop diecasting supplier, NAGAE is positively developing new technologies and methods to offer high quality die-casting products made of aluminum, zinc, and brass. We have kept pace with the latest developments in technology through ongoing investment in equipment, processes, and its management. 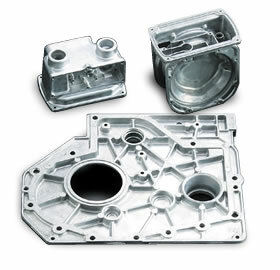 One of the major problems in the field of die casting is caused by porosity in the cast object. As compared with products provided by other casting techniques, die castings, due to the nature of the die casting process, are characterized by a relatively high degree of porosity. In the pore-free die casting technique, an oxygen is introduced into the die to react with the liquid metal. The vacuum created by the reaction reduces the porosity.